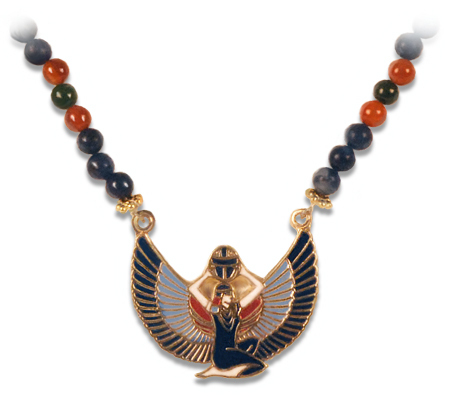 Thank you for your interest in the Goddess Isis necklace. This amazing winged Goddess is still celebrated today. She is also known as the goddess of countless names. This is because of her immense power in all realms of life. I believe there’s a goddess in all of us, and to awaken her spirit is to discover your true path in life, the path to success. The women I know who are the happiest and the most fulfilled are those who’ve been true to their passion and nature. I recommend this beautiful Egyptian Talisman as a means to awaken the Isis that resides in all of us. Please keep in touch so I can hear your own personal story of achievement. Thanks for your interest in the Moon Bracelet. The moon and its different phases are powerful forces for attracting wealth and well-being. When you wear this stunning cuff and follow the rituals I provided, you can harness this power and enjoy levels of success and abundance you’ve never dreamed imaginable. The materials used to create the Moon Bracelet make it not only a true thing of beauty but also provide additional powers. Sterling silver, mother of pearl and black onyx are all associated with banning negative energy around you and inviting strength, growth and renewal into your life. I hope you’ll keep in touch with me to let me know how the Moon Bracelet has enriched you, and also check back often to see how this gorgeous and unique piece, has helped other people realize their dreams. The Bracelet of Power is great!